Vaugn, Brian K. Saga, vol 1. Illus. Fiona Staples. Berkeley, CA: Image Comics, 2012. Print. Summary: Racial opposites, Marko and Alana, fight on opposing sides of a bloody interstellar war, until they fall in love. Defecting from the army, they run away and begin a family. With a new baby to care for, they escape danger after danger as they seek to lead a new life on a new planet anywhere else in the galaxy where they can be peaceful and happy. Critique: All the books in this series are short, but don’t expect a quick read. The artwork is too exceptional to flip past. While the plot tends to follow familiar and comfortable archetypal patterns, the quantity, diversity, and originality of the worlds and creatures rendered in Staples’s poised drawings are dazzling, baffling, and amazing! Not since the living days of Jim Henson have feral minds been exposed to such an intoxicating wealth of believable and endearing fantanimals! This entry was posted in Annotations and tagged amreading, annotating is a good habit, Brian K Vaugn, fantasy, Fiona Staples, good reads, graphic novel, Jim Henson, reading, Saga, science fiction by jenmichellemason. Bookmark the permalink. 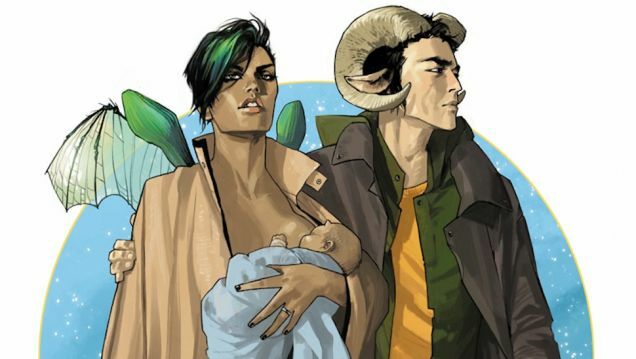 Just read through Saga, and it’s amazing how different the different worlds are to each other. I’ve seen few scifi fantasy blends that put together that many different things that successfully. Now that you mention it, I can see the Jim Henson parallel, especially considering Farscape’s aliens.